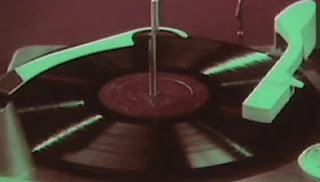 "Here I am a record on a jukebox/A little piece of plastic with a hole - oh!/Play me - Play me and my plastic turns to gold"- 10cc, "Worst Band in the World"
"Record keeps on spinning/Makes my life worth living...Record keeps on turning/All the hits I'm learning/Play forever in my mind" - The Tweeds, "I Need That Record"
Since 2007, the third Saturday in April had been celebrated across the world as Record Store Day. In honor of this auspicious event, this post includes a shout-out to six documentaries I've found that address the independent record store - whose numbers are growing ever more scarce, despite a sudden resurgence of interest in vinyl by both fans and record-releasing bands alike - including this year's official Record Store Day film, LAST SHOP STANDING: THE RISE, FALL AND REBIRTH OF THE INDEPENDENT RECORD SHOP (UK, 2012). Record Store Day makes me appreciate those few vinyl survivors and renegade holdouts - like Catonsville's Trax on Wax, Waverly's Normal Books & Music, Hampden's True Vine and Celebrated Summer Records, Fells Point's El Suprimo Records, Belair's Coda Records - that continue to fight the good fight for 45- and 33 1/3-rpm sonic purity. 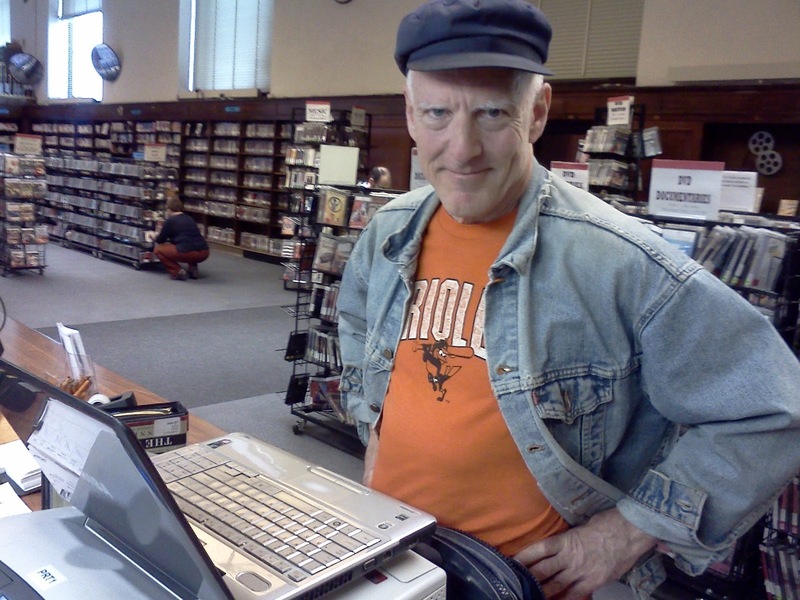 Watch Trax on Wax owner Gary Gebler wax poetic about records in this WJZ-TV Record Store Day report. As the Modfather Paul Weller says, "There are so few record shops left that we should all treasure those remaining." Weller is performing live, along with Irish rockers The Strypes, at East London's Rough Trade Records this day. (Many local record stores are also featuring live music today.) And Weller, like many other musicians (in a new tradition I like), is releasing a new single - on vinyl - to coincide with the tribute to record stores. Thanks to 12XU Records, so is my boy Tommy Keene, who's re-releasing a picture sleeve edition of his double A-side "Back To Zero Now"/"Mr Roland." 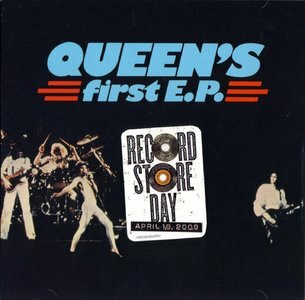 I'm surprised that Amy Linthicum neglected to tell me that her favorite stadium rockers Queen used the occasion of Record Store Day to release Queen's First EP, a 7-inch vinyl compilation initially released in 1977, on CD - as well as a contest to win an autographed Brian May guitar! (I know Dave Wright probably already has it!). And Baltimore's own Double Dagger (who are officially no more) released their swan song(s) album, 333 today. I don't know much about this group featuring our friend Donna Bowen's drummer son Denny, but am looking forward to seeing the documentary about them at this year's Maryland Film Festival, If We Shout Loud Enough. And this very weekend the AFI Silver Theatre in Silver Spring is screening RECORD PARADISE: THE MUSICAL LIFE OF JOE LEE (2012, 53 minutes) in recognition of Record Store Day. 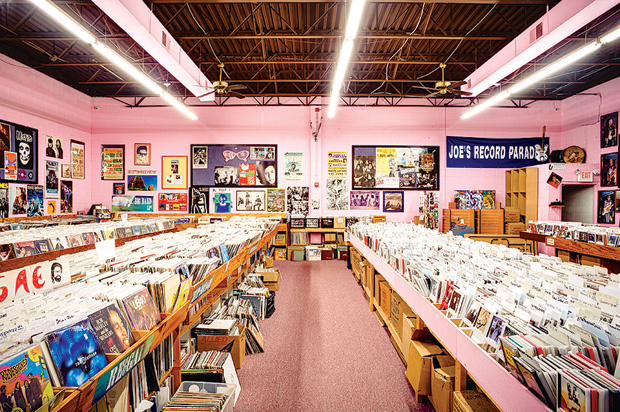 The documentary profiles the record store owner and Maryland native who founded Joe's Record Paradise located on Georgia Avenue in Silver Spring in 1974 (which later had a brief Baltimore outlet in Lauraville on Harford Road). Watch the RECORD PARADISE trailer. Watch Docs in Progress' "Changing Frequencies: Joe's Record Paradise." The AFI's capsule description reads: "A product of two of Maryland's seminal families - the Lees and the Blairs - Joe Lee was kicked out of prep school and rejected the world of politics and business that so many of his family embraced. This film documents the unique personality of a man who paved his own path, exploring both the history of Lee's storied political family and the deep musical traditions of the Baltimore-Washington area. Rare archival footage, rollicking music and poignant interviews help set the scene." Along with Chick Veditz's Chick's Legendary Records in Mt. Washington, Vinyl Discoveries on Belair Road in Hamilton, and Skip Groff's Yesterday and Today Records in Rockville (not to mention all the others like Record Theater, the old Record & Tape Trader in Rodgers Forge - where I bought so many punk-New Wave singles and LPs! 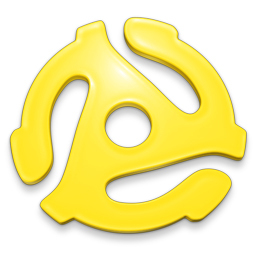 - Record & Tape Collectors, etc., etc. ), Joe's Record Paradise was one of the great area record stores. Lee and director Michael Streissguth (Johnny Cash at Folsom Prison) will be in attendance. But if you can't make it to the AFI Silver tonight, check out one or all of the following docs (or re-watch Hi-Fidelity if you're in the mood for a feature film). 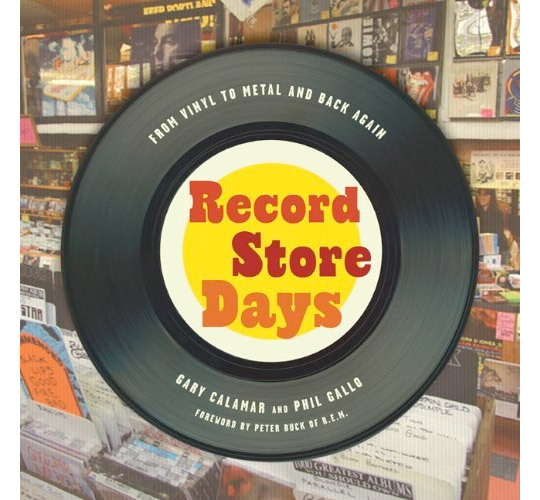 And be sure to read the wonderful book Record Store Days (which I just checked out of the library today!). 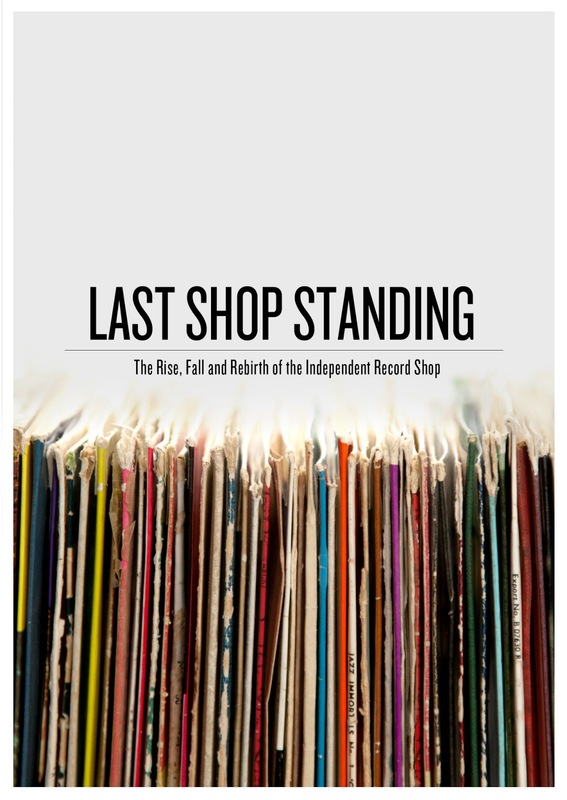 Official site description: "LAST SHOP STANDING is collaboration between award winning feature film company Blue Hippo Media and Proper Music Publishing Ltd.
Based on the successful book of the same name by Graham Jones, LAST SHOP STANDING is a 50-minute documentary that was released on 10 September 2012. It is a celebration of the unique spirit of comradeship and entrepreneurial ingenuity that has enabled so many shops to keep operating successfully against the backdrop of massive changes in the music industry, the biggest recession in years, the growth of online file sharing and the explosion of choice in music consumption. Not long ago there was a record shop on every high street, but over 500 independent record stores have closed during the last few years. Record shops were always more than retail outlets, they are part of our culture; they support new bands and local talent. A place for musicians and music fans to congregate, to browse away a few hours, to walk away with music they didn’t know existed. 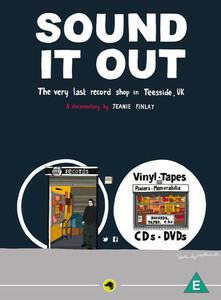 The film features appearances by musicians and industry insiders including Johnny Marr, Norman Cook, Billy Bragg, Paul Weller, Nerina Pallot and Richard Hawley , but the real stars are the record shop owners, their stories are the stuff of folklore! The film tells the full story, holds back no punches, but also celebrates and promotes our great independent record stores." Watch the official LAST SHOP STANDING trailer. Watch Johnny Marr excerpt from LAST SHOP STANDING. I love Johnny Marr's description of record stores as "a library for your ears and your mind" and his characterization of listening to .mp3s as an ultimately "vague...infinite experience" that doesn't engage like the "bookend-ed" start-flip-and-finish ritual of listening to records. Digital playlists are not engaging because they "never kind of...complete." Exactly! 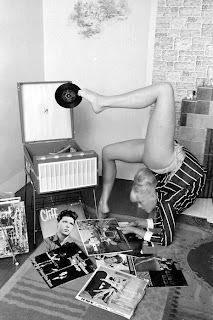 Marr's comments mirror those of Norton Records impresario Miriam Linna in Brett Milano's Vinyl Junkies: Adventures in Record Collecting: "A record is that object that you can hold and watch and learn from. Look at the label, it's got all that information that somebody wanted to give you. There's the names of the people who wrote the songs, the names of who published it, and maybe where the record comes from - if you don't find that one, it's just another mystery to solve. 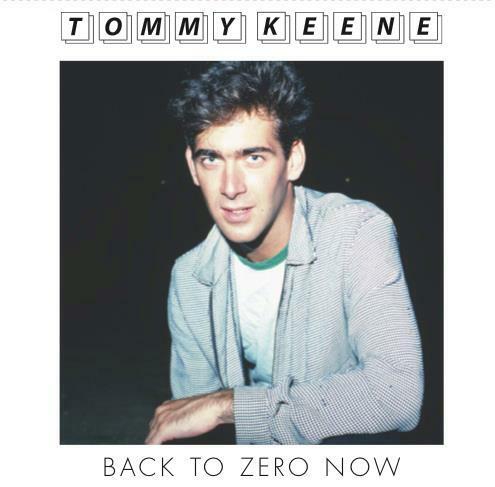 And the record, that's a couple of minutes of instant gratification; it's as good as a good cup of coffee. And it's a common denominator, you want people to be clued in. You play someone a great record and they don't react to it, you know it's time to get them out of your house." That's engagement; that's living in the moment! Watch all video clips for LAST SHOP STANDING. A documentary feature examining why over 3000 independent record stores have closed across the U.S. in the past decade. Description: "Guerilla filmmaker Brendan Toller unleashes "an elegy for a vanishing subculture...a lively, bittersweet film that examines - with caustic humor, brutal candor, and, ultimately, great affection - why roughly 3,000 indie record stores have closed across the nation over the past decade," (Johnathan Perry, Boston Globe). 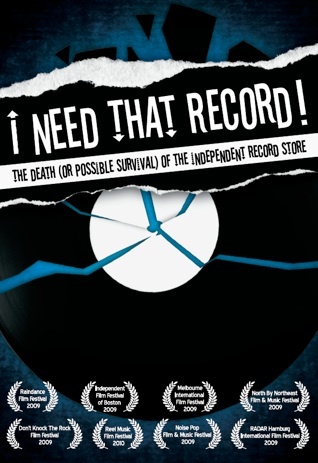 A tour-de-force tale of greed, media consolidation, homogenized radio, big box stores, downloading, and technological shifts in the music industry told through candid interviews, crestfallen record store owners, startling statistics, and eye-popping animation. Fat cats or our favorite record stores? You decide." Watch it online for free at Crackle! It's only 28 minutes long, but hey it appeals to my attention span and like a good 45 is well worth a quick spin! Watch it online for free at snagfilms.com. RECORD STORE DAY - THE DOCUMENTARY uses great archival footage of record plant production and current interviews with leaders of music explaining an audiophile's holiday and some of their favorite records and what Record Store Day means to them. Interestingly, one interviewee (Doyle Davis of Nashville's Grimeys) claims that the idea for Record Store Day originated right here in Baltimore, tracing its roots to the (2008?) Noise in the Basement Conference where "guys who own record stores sitting around, spit-balling ideas" hatched this great notion of countering the gloomy predictions of record stores going out of business. I could kick myself that I missed this when it screened at the 2011 Rehoboth Independent Film Festival because it's hard to find (Netflix doesn't have it and there's only a trailer available online, though BBC Four did air a 60-minute version online for a while) other than purchasing it directly from the film's official web site. High Fidelity with a Northern Accent." Watch a preview trailer here. Watch Kickstarter promo video (look for Elvis Costello at the end!). Official Kickstarter site synopsis: "Director George Lucas researched the soundtrack for "American Graffiti" at the store and B.B. King, Bonnie Raitt, Sammy Hagar, Ry Cooder, Cab Calloway, Jerry Garcia, Huey Lewis and Elvis Costello are among the many stars that have hung out and shopped there over the years. One could always discover something new in this enclave of vintage vinyl and vast memorabilia – enough to rival any respectable American cultural museum. What made Village Music so unique was its proprietor, John Goddard, a one-of-a-kind music historian and collector who bought the shop in 1968, after working there as a teenager. For countless musicians, John has been a tremendous resource, mentor and friend as well as a nexus for the entire musical community – reviving the careers of forgotten artists and staging some of the most unforgettable concert parties at the legendary Sweetwater saloon. But like so many other independents, Village and John fell victim to the economic shifts of the town and the music industry, unable to compete in the iPod era, the rise of the CD and changes in taste among young music buyers." In his review for TechZwy ("Village Music Captures the Age of Record Shops at Brink of Digital Age"), Joshua Phillips added that the documentary is "about more than just a music shop. Rather, it’s a story about the evolution of music formats over the last half-century, from LP’s to 8 tracks, to the Cassettes, the CD, and now digital downloads." I look forward to seeing this film when it becomes more widely available. Lastly, I just heard about this one, which laments the demise of Bleeker Bob's Records in New York City. It was produced by the online news publication Capital New York. Synopsis from Stereogum: "Legendary Greenwich Village record store Bleecker Bob’s, a shop that has been there for pretty much every notable incarnation of the modern NYC music scene, will be leaving it’s West 3rd Street location as the landlord seeks to increase the storefront’s rent to the very expensive level of the modern day West Village. 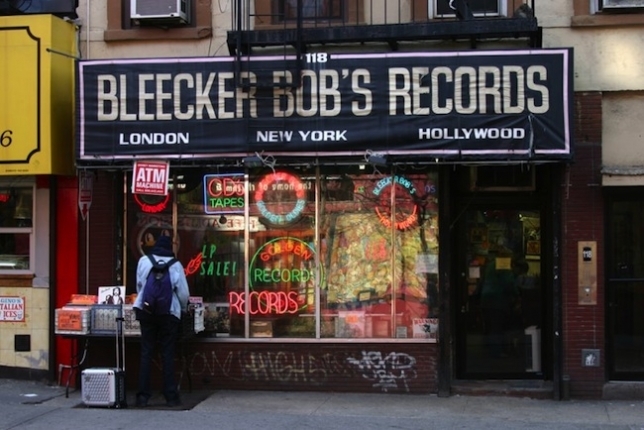 Capital New York has put together a 30-minute documentary about the store and its future called For The Records, a film that features interviews with Bob Plotnik — who opened up Bleecker Bob’s in the ’60s, right in the heart of the Greenwich Village folk scene — and other characters integral in the store’s legacy. " When Bob Plotnik quit law to open up a record store in Greenwich Village in the '60s, the only thing he wanted was to get hold of his favorite street doo-wop records ahead of everyone else. He couldn’t have known that the store would still be there nearly 50 years later—that it would survive the introduction of cassettes, CDs and MP3s, outlast CBGB, even stay open after Bob had a huge stroke and handed the store over to his colleagues to run. And though "Bleecker Bob" is identified with some of the great names of rock and roll through the decades, and especially downtown movements from the Village's folk scene through punk, new wave and alternative music, now, time is finally catching up with the oldest record store in the Village. 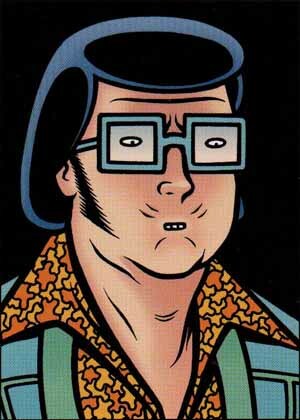 There are cracks in the black and white linoleum floor. Dust gathers on Bob’s collection of art deco clocks, many of which have stopped. Though the landlord of their building on West Third Street has been good to Bob over the years, he’s finally putting the rent up in line with prices in the area. Bleecker Bob’s is getting priced out. Bleecker Bob’s will stay open until the landlord has found a new tenant. When it goes, it will take with it a huge part of the history of the Village. And it looks unlikely to find a new place to open up. Here, meet the people who made the store a New York institution, and watch as they struggle to decide what's next. And, next time you're in the neighborhood, stop in while you can. Sadly, Bleecker Bob's record store has since been replaced by a frozen yogurt joint, which gives countless record junkies The Big Chill. Watch FOR THE RECORDS (YouTube). 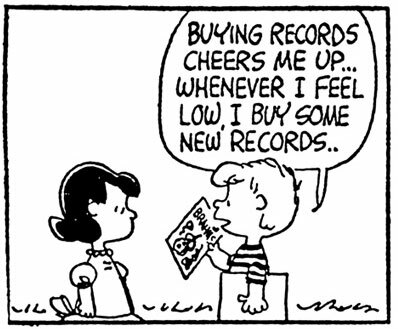 So enjoy Record Store Day and remember - all sales are vinyl! Here at Pratt, we interact with a lot of interesting - even (dare we say) “unusual” – people that frequent the library on a regular basis. Nowhere is this more evident than in the Sights & Sounds (SAS) Department on the main floor of the Central Library. Not only is this department a busy passageway between the Central Hall lobby and the Annex’s Public Computer Center, but it’s also home to a large collection of both educational and popular entertainment audiovisual materials –everything from fiction audiobooks and music CDs to DVDs of popular television series, Hollywood movies, critically-acclaimed foreign films and award-winning documentaries addressing every conceivable topic. Naturally, we get lots of people just looking for the latest popular entertainment titles – be it this year’s Oscar-winning movie Argo, the new album by Justin Timberlake, an audiobook version of Fifty Shades of Grey, or the latest season of Downtown Abbey. But we also tend to attract a number of regulars that might best be described as “creative” or “artsy” types - film, music, and literature fanatics that veer off the well-beaten track to traverse the roads less travelled. When he’s not talking Orioles baseball, former Pratt volunteer and life-long “cinemaniac” Peter Geier is foraging through our Foreign Film and Documentary racks to find more material for his impressive film review blog, Moom Pitchers Not To Miss (which is old Baltimorese for “moving pitchers”). Peter most enjoys discovering lesser-known movies in our collection, be they early “pre-code” Hollywood films, 1950s British Free Cinema documentaries, post-war productions from communist East Germany’s DEFA Studios, or Morris Engel and Ruth Orkin’s rarely seen American independent features Little Fugitive and Lovers and Lollipops/Weddings and Babies. In addition to knowing a lot about film, Peter’s a polyglot who speaks four languages, including Russian, German and Turkish. 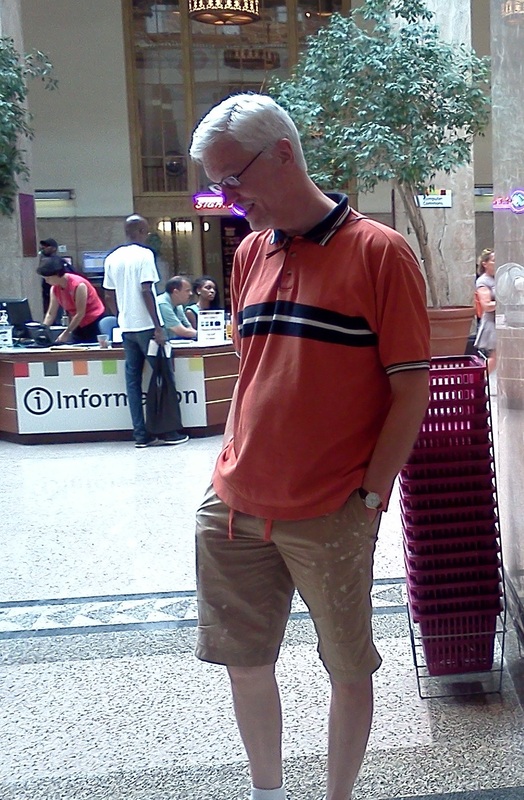 In fact, when we received some Russian language-only movies, it was Peter who checked them out and told us what they were about! He’s probably seen more of our collection than our staff, so in future we might have to use him as a Viewers’ Advisory resource! Dan is an articulate, classically trained musician who likes movies almost as much as classical music. Dan actually treats our “Staff Picks” as if they were Gospel: put it on display, and Dan will press play. He has viewed virtually every video in the department. Yes, we said “video” – that neglected analog format seemingly destined to appear on a future episode of Antiques Roadshow. Not only does this mean there’s always something on the shelf for Dan to grab, but it’s also allowed him to discover many hidden gems “Lost in the Stacks” of SAS (some of which have never come out on DVD) like Greta Garbo in the original The Painted Veil (1934) or obscure documentaries about chewing gum, cane toads and cockroaches. I've actually given Dan some videos from my massive home collection to watch and told him he could keep them. But, unlike me, he's not a pack-rat clutterer - once done, he promptly returned them, adding, "I wouldn't want to deprive someone else from getting enjoyment from them." Dan's a model citizen (and must have a very tidy apartment)! Paula lives around the corner from the Central Library and uses much of her free time since retiring from the Social Security Administration roaming our aisle for foreign films, topical documentaries, and music of all genres (though she’s most partial to jazz from the ‘20s and ‘30s and ‘40s and vintage ‘50s and ‘60s R & B singers like Big Joe Turner). 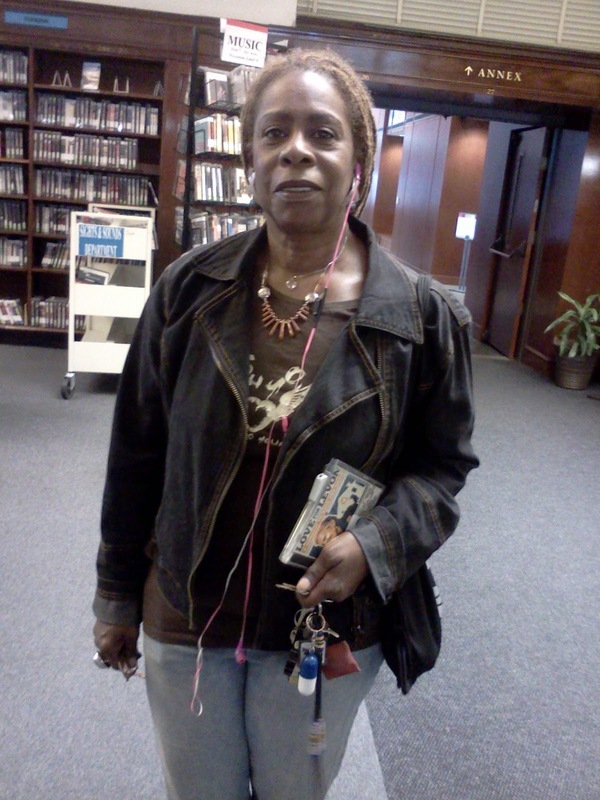 When asked what attracts her to our Foreign Film collection, Paula replies, “Hollywood movies are just too predictable. I like to watch foreign films to get a better perspective on how other people live and what’s going on in the world.” Her favorite movies are the colorful song-and-dance spectaculars from Bollywood and gritty Brazilian films like City of God (“I own a copy now”) and Black Orpheus (“Which I never get tired of re-watching”). Part-Cherokee herself, Paula also likes to watch Native American movies like Smoke Signals and The Business of Fancy Dancing, as well as documentary series like We Shall Remain: America Through Native Eyes . But that’s about as likely to happen as Sights & Sounds running out of interesting patrons to assist and befriend.